If you regularly pack your lunches using containers, you need to know this hack. Salads are a great healthy meal to take for lunch. However, you generally need to keep the salad dressing separate or it will become a soggy mess by the time you are ready to eat it. But then it is easy to forget your dressing altogether or have it spill out all over your lunch bag. One woman made Twitter go crazy when she posted a seemingly innocent photo. She shared a photo of her meal prep when people noticed something interesting about the lids of her Glad containers. Many people use Glad containers for their durability and ease of use to bring food places. Did you realize that the circles on their lids have a separate use? We always thought it was just there to push air out and keep a tight seal. It actually has another amazing use, especially for salads or other dishes that need dressing or sauce! If you have those little circle containers that Glad and other companies sell, the circles in the lids are made to hold those containers. They can keep spreads, salad dressings, dips, sauces, extra toppings and more. The funny thing is Glad has marketed this! Apparently not well enough because most people never even realized this was a possibility. Good thing we learned it now. Lunches will never be the same. If you don’t have any of these Glad containers in your pantry, you can buy these in a pack. 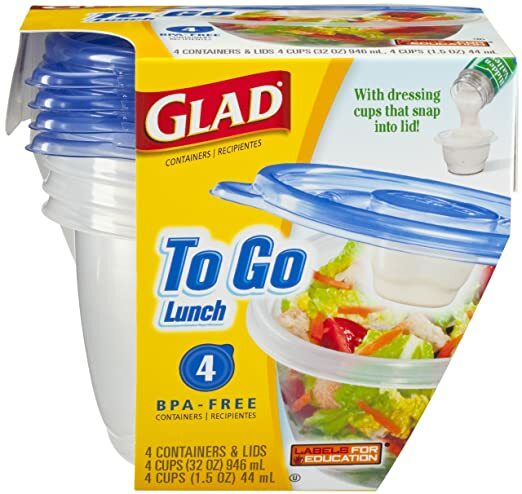 According to Glad’s website, these containers are dishwasher-safe, microwavable, BPA free, and of course, contain interlocking lids. You can fill these containers with three cups worth of food, which is perfect for a lunchtime salad! They also sell a To Go Lunch container with a cup specifically for dressing. If you are interested in these containers, check out the To Go Lunch container on Amazon for a great price. Do you use these containers? Did you just learn something new for your next packed lunch? Or have you been doing this all along? If you found this article interesting, please SHARE with your friends and family who could use this lunch packing hack! The post You Need This Glad Container Hack For Your Next Packed Lunch appeared first on Do You Remember?.